SCVHistory.com | St. Francis Dam Disaster | 3 Minutes to Midnight at the Dam | By Jim Harris, 3-13-2018. 3 Minutes to Midnight at the Dam. By Jim Harris | SCVHistory.com | March 13, 2018. Photos by Hector Vasquez | Click each to enlarge. At three minutes before midnight we turned off our flashlights. It was at this moment, on the spot where we stood, the Saint Francis Dam failed 90 years ago. Twelve billion gallons of water in a column 175 feet high poured forth, traveling at 17 miles per hour. Five and a half hours later the monstrous, debris-choked water ended its reign of terror, dissipating into the ocean 54 miles away near Oxhard. An estimated 411 people lost their lives in the black morning hours. The towns of Piru, Fillmore, Santa Paula, Saticoy and more were engulfed, and dozens of ranches, as well as the Harry Carey Trading Post in Saugus and the (now) L.A. DWP's Power House No. 2 were destroyed. Organized by Mike Summy, a group of nine friends met at the dam site to experience what it might felt like on that infamous night. Dan Kott, who grew up living in DWP housing near the dam site, is a local expert on the dam failure. Dan provided a wealth of information, explaining details about the dam failure gleaned from his boyhood and in his capacity as a retired aqueduct supervisor. 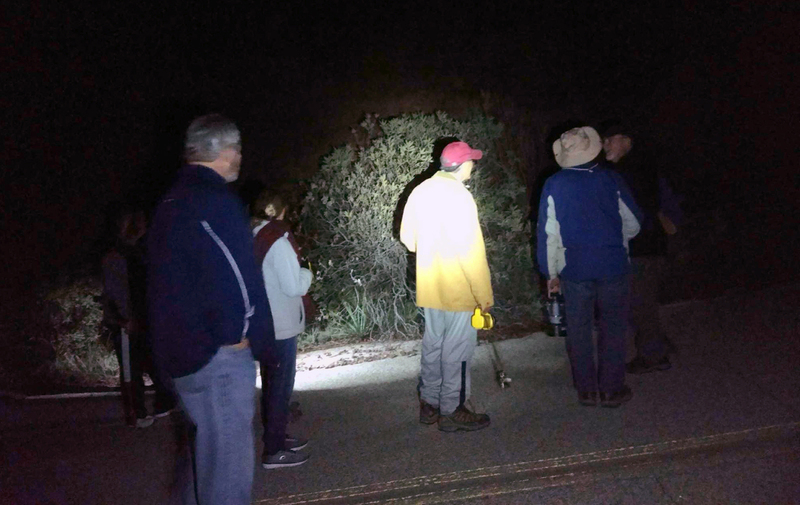 When our moments of silence were over, a group of school children from Rancho Pico Junior High, accompanied by parents, descended from the old, deteriorating wing dike 175 feet above us. 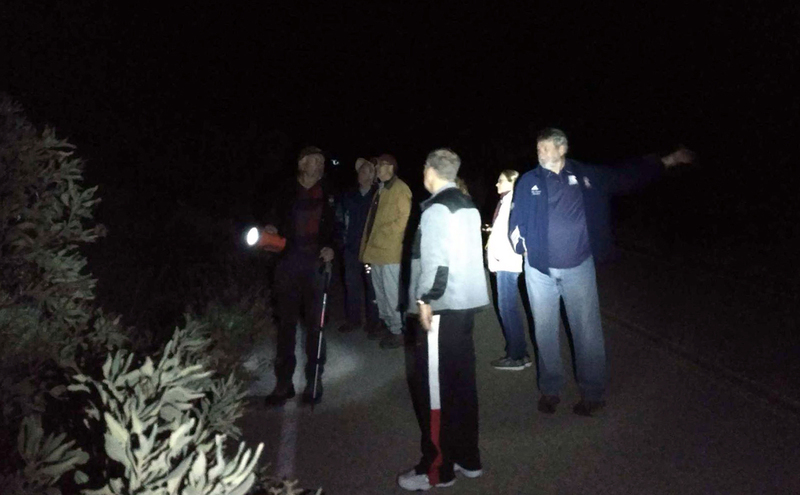 We were not about to follow their example and scramble up a steep slope to see the old dike structure in the inky night. So, we returned to our cars and our homes, full of thought. I, for one, acknowledged the vicissitudes of life, how you think things are so permanent, and how untrue that is. Jim Harris is a member of the Placerita Canyon Nature Center Associates. Dan Kott, left, explains we are standing exactly where the dam stood from 1924-1928. 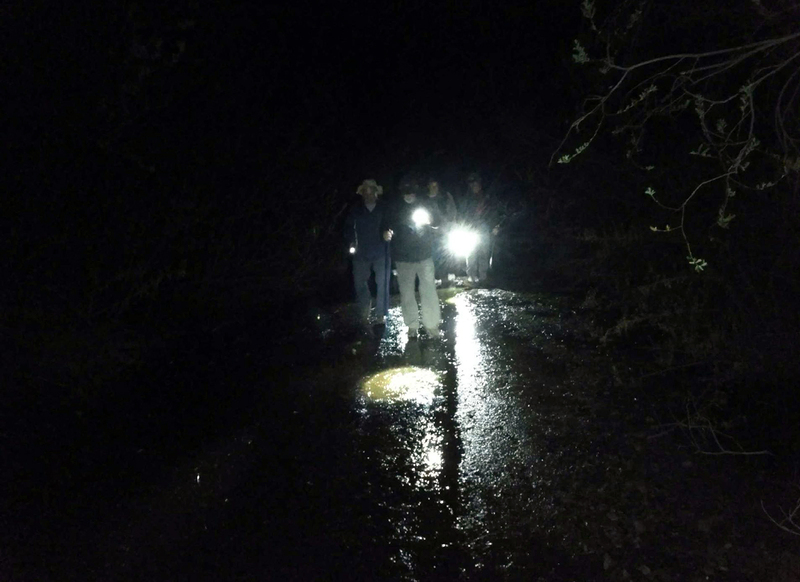 After the dam break, San Francisquito Canyon Road ran through the middle of the dam site. Now even the road lies quiet. 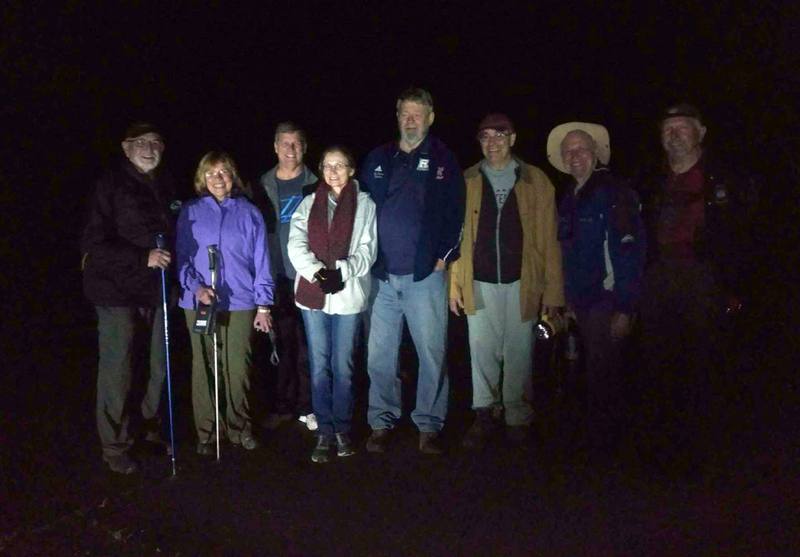 Midnight visitors, from left: Jim Crowley, Helen Sweany, Mark Hershey, Geri Summy, Mike Summy, Jim Harris, Robert Grzesiak, Dan Kott.